It’s been a busy spring! We have been blessed with plenty of work, with many new and exciting projects coming up the pipeline. Because of this abundance of new work, we are now hiring, so make sure to send your family and friends in need of a job our way! Applying has never been easier, as we now have the capability of receiving applications online. Just go to the Careers tab on our website. 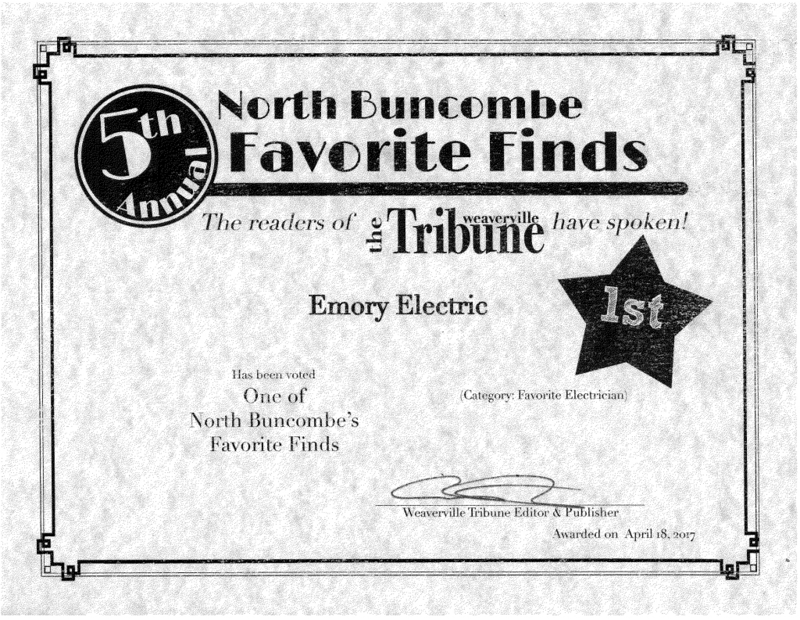 In other exciting news, Emory Electric has been awarded 1st place in the 5th Annual North Buncombe Favorite Finds Favorite Electrician award – voted by the readers of the Weaverville Tribune! We are very proud of this award and will strive to continue to be a valued and respected business in our community. Thanks to all those who voted!